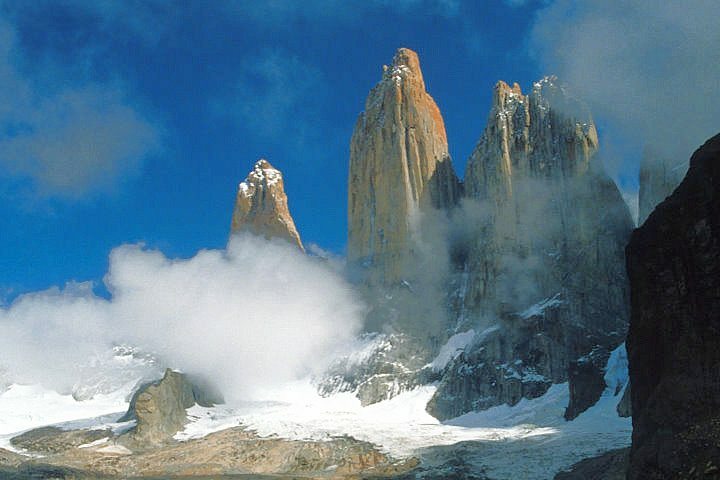 Discover the Chilean Lake District and Southern Patagonia on this fascinating tour of Chile. You will begin in Santiago with a city tour and winery visit, and continue on to the Lake District. You will cross All Saints Lake by catamaran to Peulla, and explore the Island of Chiloe. The last part of your trip will be Torres del Paine National Park, one of the best parks for outdoor enthusiasts in all of South America, with campgrounds, vast hiking trails, and a spectacular natural setting. Lodging and Meals: This tour includes accommodations for 8 nights (2 nights in Santiago, 3 nights in Puerto Varas, and 3 nights in Torres del Paine), and 15 meals (8 breakfasts, 4 lunches, and 3 dinners). Places Visited: Santiago, the Chilean Lake District, and Torres del Paine National Park. After passing through immigration and customs, proceed to the reception area, where our inbound services representative will be holding a sign with your name on it. You will be greeted and then transferred to your hotel. Overnight in Santiago. Day 4: Santiago-Puerto Montt-Puerto Varas-City Tour. Transfer to the airport for your flight to Puert Montt. Upon arrival, you will have a panoramic city tour of Puerto Montt and Puerto Varas. Puerto Montt is the main transportation hub for travelers to Chiloe, Chilean Patagonia, and the Lake District. You will drive through the downtown area, passing the Plaza de Armas and the Cathedral, and then along Av Angelmo to the small fishing village and ferry port of Angelmo, where you can visit the fish and crafts markets. Day 5: Puerto Varas-Petrohue River Falls-All Saints Lake-Boat to Peulla. Day 6: Puerto Varas/Island of Chiloe/Ancud. Day 7: Puerto Varas-Puerto Montt-Punta Arenas. Day 8: Punta Arenas-Torres del Paine. Group Private: All airport/hotel transfers are private, and the city tour of Santiago, vineyard tour, city tour of Puerto Montt/Puerto Varas, and the excursion to Chiloe are private for 4 Star, 5 Star, and Deluxe accommodation levels. All services in Punta Arenas and Torres del Paine are operated on a small group basis. Elevations: Santiago is 1,700 feet above sea level, Petrohue is 810 feet, and Torres del Paine National Park elevations can reach 4,000 feet or more, depending upon your itinerary. To Book This Trip: For 3 and 4 Star accommodations, we require a non-refundable deposit of $900 in single occupancy, and $800 per person in double and triple occupancy. For 5 Star and Deluxe accommodations, we require a non-refundable deposit of $1,500 in single occupancy, and $1,200 in double and triple occupancy. The balance of the trip cost is due 60 days prior to departure.